Will Family Plans drive M2M mHealth adoption? A lot of Mobile Operators boast about how they’re on the ball with mHealth but all too often when Clinicians, Carers or Patients actually try and do anything they find themselves trying to work with a telco that is crippled by their addiction to subsidising devices and charging for subscriptions, minutes and texts in a desperate scrabble to maintain or boost “ARPU’s” (a nonsensical barometer naive members of the mobile operator community use to market their success to investors). In my experience these deluded objectives are getting in the way of telcos seeing the value of some very simple and basic M2M opportunities and this is hampering M2M mHealth adoption eg. none of the big telcos can see the opportunity they have to sell mobile connected sensor solutions (like Smoke/CO or basic intruder/care monitors) because even though the SMS or mobile data used by these devices is highly valuable the volumes they contribute are very small. 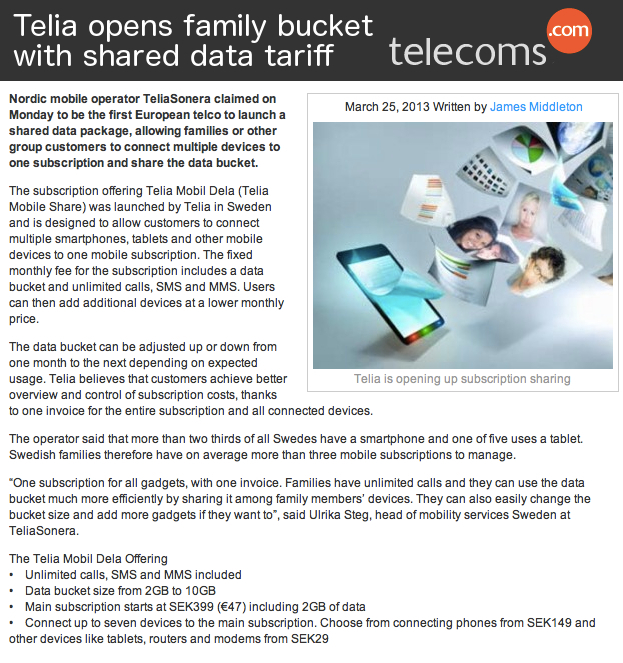 I’m optimistic that the “Family Plans” being announced by Telia are going to help these telcos break from their antiquated ideas. Now brands like Firetext can sell customers in Sweden a mobile connected smoke alarm and all that customer will need to do is ask their mobile network to give them another SIM (for €29) to put in it. So long as they continue with their mobile contract their smoke alarm (and the ones they’ll inevitably put in the homes of their parents/in-laws) will stay connected. I imagine this is going to have a big impact on churn (when you get value like this why would a €10 saving make you even consider moving network?) and in 12 months time all the EU telcos will be on the hunt to retail and provide support M2M mHealth devices that require no consumer education (citizens immediately get the value of adding connectivity to sensors they already own and rely-on).